Mere hours before the Samsung Galaxy Note 9 launch takes place today in New York, with the Samsung Unpacked event watchable directly via a Note 9 live stream, footage of Fortnite Mobile, a supposed launch exclusive for the phone, has leaked online. 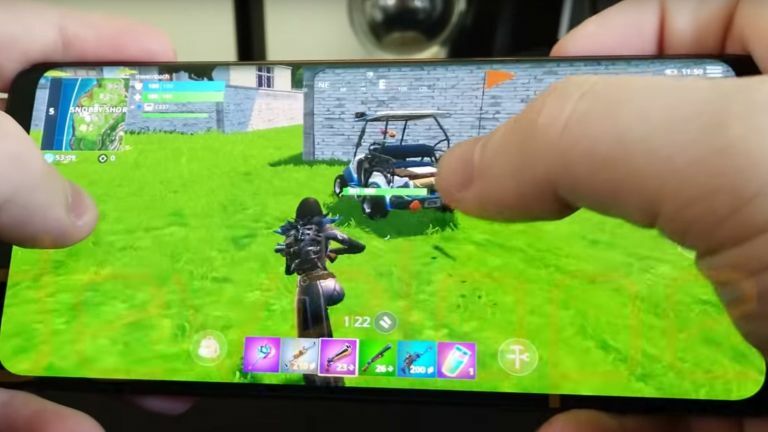 The video shows the incredibly popular Fortnite game running on a Samsung Galaxy S9 Plus, which was hacked into working by xdadevelopers and some of their community members, who not only obtained the Fortnite Mobile Android APK but also bypassed lock downs to get it running. And, simply put, the video reveals A LOT about the game, with everything from the game's menu screens and options, to vehicle driving and intense shooting action detailed vividly. Now, as previously reported, Samsung has partnered with Epic Games to launch Fortnite Mobile with a timed exclusive (rumoured to be 3-4 months), with the Note 9 and Samsung Galaxy Tab S4 believed to be the two devices that would get access to the game first. Naturally, a big Fortnite Mobile reveal during the Note 9 launch is still to be expected, however, thanks to this leaked footage it now appears that the timed exclusive could very well be for all Samsung Galaxy devices, or at least the most recent ones, with phones like the Galaxy S9 and Note 8, as well as Galaxy Tab S3 tablet potentially also getting in on the Fortnite Mobile action. Of course, nothing is confirmed by Samsung yet regarding Fortnite Mobile's official compatibility with the Galaxy S9 Plus, however, it seems that at the very least you could get it running, albeit unofficially, if you really wanted to. The Samsung Galaxy Note 9 launch is taking place later today. After all, while the Fortnite Mobile looks pretty darn impressive graphically for a Android game, we see no reason why it couldn't run well on many of this year's flagship phones. We already know the official Note 9 specs, and while very powerful, sit very firmly in the same ballpark as other high-end Android phones like the HTC U12 Plus, OnePlus 6, and Sony Xperia XZ2, so the exclusivity of the game should not be hardware reliant. We're impressed with how Fortnite Mobile looks and plays though, and we can't wait to see and hear more about it at today's Samsung Unpacked Note 9 launch event. Check back in with us at 4pm BST today for the full Fortnite Mobile on Note 9 story.